Imagine a field guide to all the animals you'd encounter on an African safari, but instead of looking at a photograph of them in the book you're reading, you're actually seeing a small film clip on the page of the animal in motion. It's a "PhoticularTM Book" - a lenticular-based technology that transfers fluid 4-color movies onto a book page. Why just read about the way a cheetah can run up to 60mph when you can actually watch him running, too? It's like having a coffee table book come to life in your hands. Featuring eight gorgeous animals (cheetah, rhino, elephant, giraffe, gazelle, zebra, gorilla, and lion), "Safari: A PhoticularTM Book" is full of the information you'd expect to hear from a real safari tour guide about each animal - plus an evocative first-person essay about the safari experience by nature writer and safari traveller, Carol Kaufmann. This spectacular book of "motion pictures" will leave you breathless. Ok, so I had been told that this book was going to be amazing, but I have seen amazing books before. The scanimation titles by Rufus Butler Seder were amazing and unique, and I loved them. Today I have been knocked over by this new book that uses Photicular technology. The other surprise was the amount of text and information in this book. 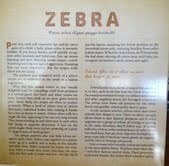 I had expected it to be all about the pictures, but this has quite a lot of information about each animal too. For every picture there is one full page of information, and then there are quick facts listed about each image, so you can get as much or as little information as you need. The page of information is quite ‘wordy’ but the way it is written make it very readable as well as being informative. At the front of the book there is an introduction that gives some information on the technology used, and then there is the story, Safari. There are 12 pages of a narrative that describes a visitor to Kenya, embarking on their first safari (Swahili for Journey) we get a glimpse of the surroundings, experience the knowledge imparted by the tour guide, and see pencil drawings of the animals. The language is rich and feels quite old fashioned. There’s information on the safari business, hunters and even the effect that the human presence has had on the wild animals. Because of the story at the beginning really opens this book up to readers of all ages, little children will just LOVE the images, while older readers and adults will find the story insightful and be amazed by the images. I can imagine a teacher/parent reading the story to a class/child before they even see the amazing images inside. 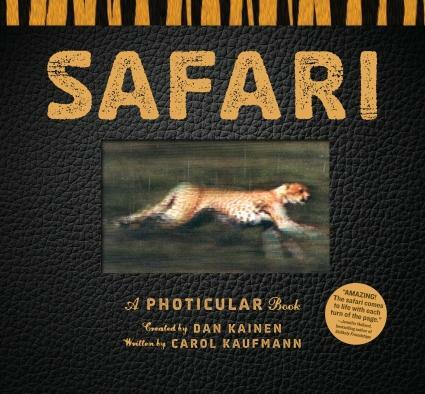 The descriptive language will mean that the child already has an image in their heads of what can be seen on a safari, only to be blown away with the images in the book bringing the animals to life! I have included a link below that show the images moving, but even that doesn’t do it justice, it really does have to be seen to be believed.